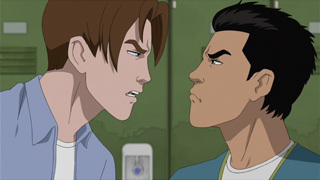 In 2012, Marvel Studios and Disney XD launched The Ultimate Spider-Man animated series. 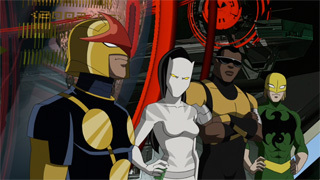 The show featured Spider-Man joining SHIELD along with four other teen superheroes including White Tiger, Iron Fist, Luke Cage and Nova. The Nova featured in the program was the Sam Alexander Nova (Point One Nova). 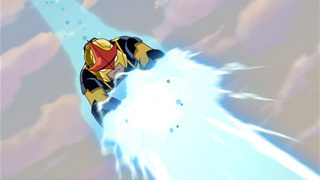 In the show, Sam is an inexperienced hero who channels the Nova Force through his helmet and does not know how his powers work. Commercial for the upcoming first season of Ultimate Spider-Man. It features the first TV appearance of the Sam Alexander Nova. After Spider-Man joins SHIELD, he is teamed up with four other superpowered teens. These young heroes are Iron Fist, White Tiger, Power Man and Nova. 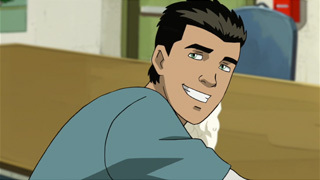 This episode is the first to feature Nova (Sam Alexander). In order to prove themselves to Nick Fury, the four superheroes travel to Latveria to capture Dr. Doom! After capturing the international supervillain, they discover that being taken to the SHIELD helicarrier was Doom's plan all along. Doctor Octopus gains a blood sample from Spider-Man and is able to create an evil symbiote called Venom. The lifeform attempts to take over each member of SHIELD's young superhero team including Nova! 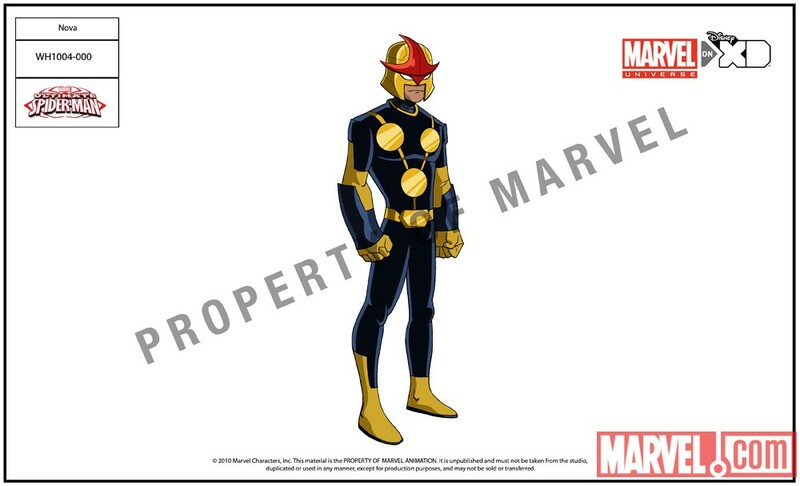 Following this episode, Nick Fury's file on Nova aired detailing his history and powers. Iron Man meets the team and Spider-Man has a case of hero-worship. Later, Tony Stark builds Peter Parker a suit of hi-tech armor. The team has to deal with Spider-Man's new powers along with his new attitude. Spider-Man and White Tiger fight the Taskmaster. 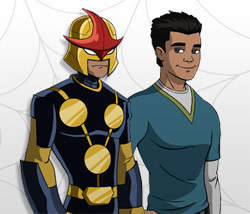 Nova only appears briefly as Sam Alexander at school. As he give Mary Jane Watson an exclusive video interview, Spider-Man must try to stop the Hulk! He later discovers the true foe is an invisible creature made of electricity. Spider-Man fights a new Venom who turns out to be Harry Osborn. 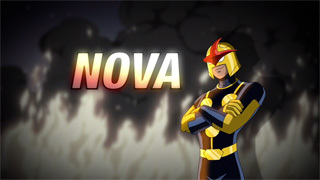 Nova only appears briefly in this episode. Nova, Spider-Man and the rest of the teen SHIELD team meet the god of thunder Thor! Together, they fight Thor's evil half-brother Loki to save the throne of Asgard. Spider-Man and Wolverine switch bodies due to the mutant powers of Mesmero. The heroes must learn how to use their new powers to fight Sabertooth. Harry Osborn returns as Venom. 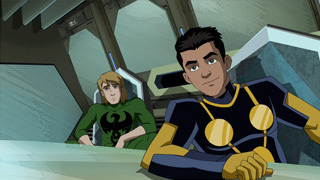 Nova and the rest of the teen SHIELD team must learn to trust Spider-Man because he refuses to reveal that his best friend is the foe they are assigned to capture. Spider-Man tells Nick Fury that he needs a weekend away from crimefighting following a battle with Whirlwind. However, Doctor Octopus decides it is a good time to attack Spider-Man! Iron Fist and Spider-Man team up with Dr. Strange to fight Nightmare in order to save New York City from a mystical sleep spell! Nova only appears briefly as Sam Alexander sleeping at school. While under the spell, Sam has a nightmare about bunnies in the classroom! Sam Alexander is paired with Ava Ayala as lab partners. Ava creates a liquid nitrogen/oxygen freon machine to reduce global warming in the atmosphere. The team of super-heroes also has to fight the Awesome Android. Spider-Man and Nick Fury team up to take back the SHIELD carrier after it's taken over by Zodiac (led by Nick's brother Max). Nova and the team must fight Trapster and later protect J. Jonah Jameson and Mary Jane Watson from the Beetle! After school is cancelled due to snow, Principal Coulson tells the team to do training and team-building exercises. Unfortunately, they decide to have a vacation day and Nova picks a desert island inhabited by the Sandman! After causing major damage to New York City during their battle with the Wrecking Crew, the team gets assigned to clean-up duty with Damage Control! Loki turns Spider-Man into a pig (Spider-Ham)! The teen super-heroes teams up with Thor to find a way to break the spell! Spider-Man and the team must stop the Trapster from attacking Flash Thompson. The Trapster mistakenly believes Flash is Spider-Man after seeing him in the costume for a school musical. The team gets to train with Captain America! But due to an accident, Spider-Man and Cap must stop Dr. Doom after Cap's shield falls into the super-villain's possession! Nova and the rest of the team must fight the Frightful Four! Meanwhile, Doctor Octopus uses Spider-Man's radioactive blood to turn Norman Osborn into the Green Goblin! The team fights the Green Goblin in order to protect Harry Osborn! The situation gets worse when Harry turns into Venom and teams up with his father!